We are a non-profit organization dedicated to training and employing people with disabilities in food services. Come in for a nice dinner out, lunch with colleagues, or our famous 'un-angry' hour! Patrons can also carry out and arrange catering from box lunches to large-scale events. Groove through the summer with live jazz every Friday night and other special events! Ready to feel the Positive Vibes? Always fresh, guilt-free food with dishes and prices for everyone! The foundation provides training & employment opportunities to individuals with disabilities. The Positive Vibe Foundation prepares its students for meaningful work in the food service industry. Reserve a private room for your next work event, networking meeting, or social gathering. Join us Thursday, April 25th for our 7th Annual Coaches' Cook-Off featuring VCU's Mike Rhoades and Chef Michelle Williams verses UR's Chris Mooney and Chef Jason Alley in the battle of the best in Richmond! From auctions to games there are so many ways to support The Vibe! Please see the Cook-Off tab on the main page to purchase tickets, and sponsorship opportunities are available...contact Garth Larcen with all questions at garthl@aol.com. 23/04/2019 — 30/04/2019 IT’S FINALLY HERE!! Join us Thursday, April 25th for our 7th Annual Coaches’ Cook-Off! Tickets can be purchased through this website on our main page, and sponsorship opportunities are available! Reach out to Garth Larcen with any questions! The Positive Vibe Foundation (formerly the Get Lost MD Foundation) has created an evolving model for training and employing people with disabilities in order that they enjoy the satisfactions of being gainfully employed and fully contributing members of our community. This focus will allow their confidence to self- actualize through the development of their diverse talents. 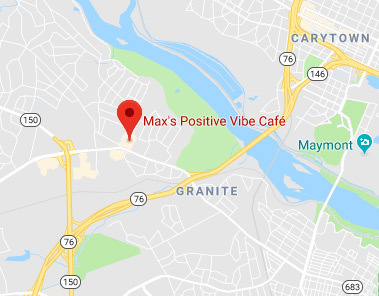 Copyright © 2019 The Positive Vibe Foundation & Max's Positive Vibe Cafe. All rights reserved. Website by Jonas Marketing.